Shack B - QRT Till Spring! Shack - B locked down for the winter! When I got in from work I grabbed some camera shots of my antennas handling our first significant snow fall since moving into this QTH just over two years ago. Here you can see the wire antenna which is a Carolina Windom 80M - 10M. Its up at around 25ft and is 131ft in Length. The picture below shows my CobWebb and Hustler 6BTV looking upwards. The nearest chimney can be seen in the lower part of the image. 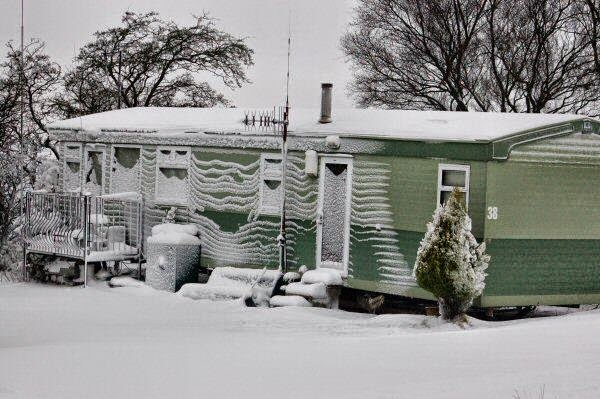 Finally a picture of my Tri-band Snow-linear, I mean Co-linear vertical antenna. The next thing to do is to see how the SWR is before any transmitting takes place, snow can cause undesirable effects to SWR. 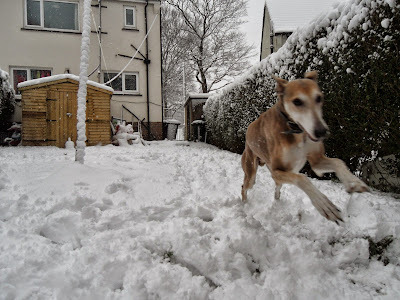 These two don't really care about the SWR they just like to play out in the snow! 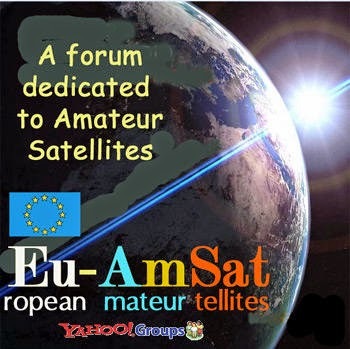 The Eu AmSat Forum has recently migrated to a new web address. The forum is well worth a visit and will be particularly interesting if you are a satellite fan or operator! The holiday was great fun with the family and we all had a wonderful few days of pure enjoyment. 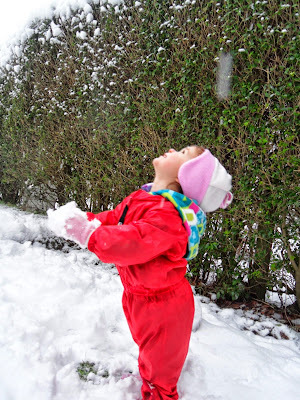 Our daughter experienced her second Christmas which proved to be very exciting indeed. Dudley the DX hound also enjoyed the festive fun especially the part which included a 2 foot marrow bone treat! 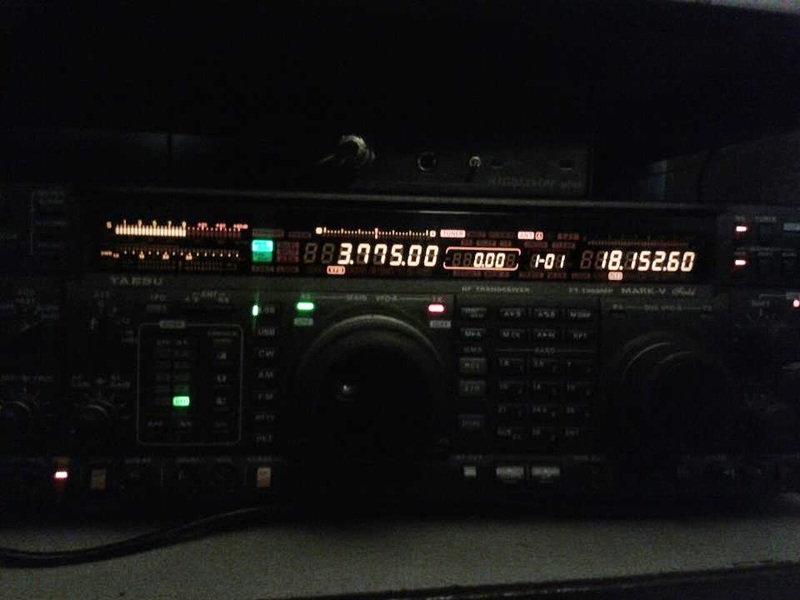 Louise and I were kept busy throughout the week and unfortunately for my blog and transceivers, I did not manage much radio time until the new year kicked in. More recently, I have been operating in the evening after 10.00 utc and have found conditions fairly quiet, the higher end of the HF bands have been more or less completely closed down but 40 meters and 80 meters have remained open. My FT-1000 MKV and Carolina Windom antenna are still doing a great job along side my CobWeb and 6BTV. Up to press, the Winter WX has not troubled them to much and I am hoping to get away with minimum antenna maintenance this winter h.i. (All hell will probably break loose now I've said that). Over the next few weeks I expect conditions will improve especially now that we have passed the half way mark of the dark nights. Until then I shall continue operating the twilight shift down on 40m & 80m during the week and as the saying goes "the sky's the limit" come the weekend! Have a good one, happy DX and a late but sincere Happy New Year!